May produced a good selection of pay per click advertising ranging over nearly all the aspects that are involved in a PPC campaign. What May’s collection of articles make clear is that there is always area to improve in PPC (and hopefully, after reading these articles, you will find a few areas you can change in your campaign to help it perform better). 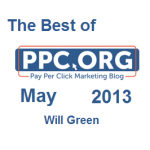 Therefore, without further ado, here are the best PPC articles from May 2013. Sometimes, even some of the best advertisers can struggle with succeeding in PPC. In these rare cases, it might be best to try a different source of traffic other than PPC. In this article, I highlight three other sources of traffic advertisers can use with some being free and some not. It might also be a good idea to use these other sources of traffic alongside PPC to make the most out of four sources of traffic. I love these types of articles above all others because they are easy to read and get to the point fast. In this article, I list 25 useful tips any advertiser can use to improve their PPC campaign. It is a great article, if you do not have the time, to quickly skim over because the likelihood is that you are not implementing all of the 25 tips from the article into your campaign. What most advertisers do not know is that the colour scheme chosen on your campaign’s landing page will contribute significantly to the landing page’s conversion rate. Therefore, it is a great idea to know exactly what each of the main colours will mean to the average web user. This is exactly what I do in this two-part article. I look at black, blue, brown, green, yellow, red and more with what they symbolise and whether or not you should use it in PPC as a publisher (for adverts) or advertiser (for landing page). Aston Martin which focus their campaign at the more price sensitive customers from running a campaign on pre-owned cars. Google Play and their take on online media stores. Ford and how they use PPC campaign to attract potential car buyers to their website. DKNY although if you read the article, you will see that there is a slight flaw with DKNY’s PPC campaign. 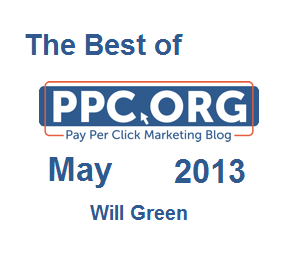 There’s the top eight best articles I believe I created in May 2013 that will benefit you the most. I hope this has proved useful to you like it has for so many other people. Do your Facebook Posts Engage More, or Sell More?